I still hear the song from the commercial every time I see one. I owe my career as a tech support wizard to my Dad and his decision to purchase a Commodore 64 way back when I was but a young teenager. He intended it to be used by everyone in the family, but it wasn’t long before I was monopolizing the machine. The love affair started off slowly because in the beginning all we had was the tape drive for loading software and it was an agonizingly slow experience. I’d often start a program loading and then go off and make lunch, watch something on TV, play with some friends, and then come back to find it was only halfway through the process. Things improved dramatically when he brought home a 1541 floppy disk drive and load times went from infinity to mere minutes. Things opened up even more when someone, I don’t recall if it was my parents or myself, bought the 1660 300 baud modem for the machine and I discovered the world of Dial-Up Bulletin Board Systems (BBS). Long before I ever started SEB I used to run a BBS on my trusty Commodore 64 (later Commodore 128 and eventually Amiga) with just two 1541 Disk Drives (170K each!). Later I added a Buscard II IEEE which allowed me to utilize four Commodore SFD 1001 floppy drives that could hold 1.02 megabytes each! Yes, back in the heady days of 1983 my little C64 BBS could store a massive 4.08 megabytes at once! Introduced in January of 1982 for $595 (roughly $1,110.26 in today’s dollars) I was reminded of this event by the BBC which did an article about it the other day because it officially hit shelves in August of that year. Go check out their article as it contains a video clip where an old-timer shows his vintage C64 to some kids to get their reaction to it. You’ll note that he’s loading games from a tape drive instead of a 1541 floppy drive. I can recall seeing C64 magazines imported from the UK that often had free games on tapes long after everyone I knew in the U.S. had moved up to floppies. Turns out they came up with all manner of ways to compress the hell out of programs on tape which made loading from a tape drive a little more bearable so they kept using them. While the 1541 floppy was faster it had its own problems that kept it from being as fast as it should have been which led to Epyx games putting out the wildly successful FastLoad Cartridge which pretty much everyone in the States who gamed on a C64 ended up buying. Turn on captions to see game names. Though two of them are incorrect (e.g. M.U.L.E is listed, but wasn’t the game shown). Speaking of gaming, the Commodore 64 was a large part of the reason I’ve never owned a Nintendo game console of any kind. When the video game market crashed in 1983 it looked like the end of console gaming until Nintendo’s NES game out in 1985 and revitalized the market. By that time I’d been gaming on the Commodore 64 for a couple of years and there wasn’t a whole lot on the NES that appealed to me. In fact, had the market not crashed I don’t know if I’d have gotten as into the C64 as I did. Games on the Atari 2600 pretty much dried up after the collapse and that moved my attention to the Commodore (we picked up an Atari 5200 just before it all went to hell, but I never owned more than 5 games for it). By the time I moved to an Amiga in late 1985 I had owned at least three Commodore 64s (one for the BBS, one for general use, and a replacement when one of the two died) and a Commodore 128, which was largely a C64 as very little software was ever made for 128 mode. 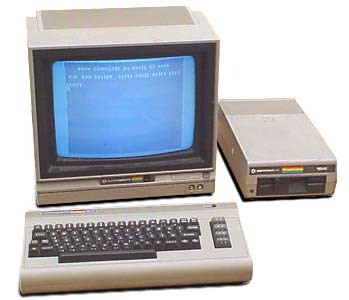 I shut the BBS down in 1986 until I picked up an Amiga 2000 and started it back up for awhile only to turn it off for the final time in 1996 as the Internet started to come into general usage by the masses, but the C64 was where I cut my teeth on computing and first dabbled in programming. Yes, the nostalgia is strong with this one. Watching the clip above of old games makes me want to fire up an emulator and see if I can’t track a few of them down. I don’t think I ever finished Impossible Mission. Which means the name was probably correct. Happy Birthday Commodore 64! You not only gave me hours of education and entertainment, but a career.